Not many people know that Noel Redding once shared a twobedroom flat off the Fulham Road with Jim Leverton, who played bass on the Walker Brothers classic The Sun Ain't Gonna Shine Anymore; that Eric Dillon is now an airline pilot in the Isle of Man, or for that matter that Fat Mattress sold over 500,000 copies of its first album in the States. 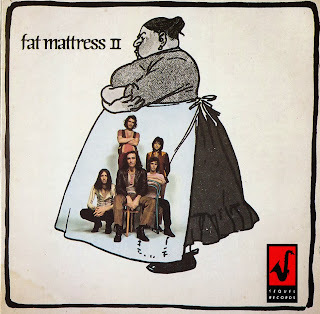 Born of frustration in November 1968, Fat Mattress survived for barely a year. They never quite came to terms with their meteoric success and the end was almost inevitable. Folkestone in the early '60s was the focus of the Kent music scene, a magnet for young musicians like Redding, Leverton, singer Neil Landon, and drummer Pete Kircher — later to play with Status Quo — who performed in bands like The Lonely Ones and The Bufnettes, and were regular favourites on the club scene. When Redding left home to join the Jimi Hendrix Experience, nothing was ever quite the same again. The old schoolmates from Harvey and Dover Grammar School, however, never lost touch. Landon joined the Ivy League, who then became The Flowerpot Men. Remember Let's Go To San Francisco? Leverton even risked loosing face amongst his peers by joining the backing band for Englebert Humperdinck, nonetheless, it served its purpose, for Leverton met Eric Dillon, a young musician from' Wiltshire, who was later to become the drummer of Fat Mattress. Then came the call from Redding. The graduates of the Folkestone music scene decided to record their own album. The name was suggested by a friend who had been in the merchant navy. Redolent of the easy life, it had nothing to do with drugs, as some suggested at the time. For Redding it was to be the antidote to working with Hendrix. For Leverton and Dillon a chance to escape the hideous Humperdinck band. Landon couldn't wait to clamber out of his flowerpot and join the party. Redding had managed to secure some studio time from Warner Brothers at Olympic in Barnes. 'It was winter. We didn't see the light of day for almost two weeks', recalls Leverton. Redding put everyone up in his flat in Thurloe Court where they lived on 'porridge and potatoes'. Noel, the only one with any spare money, would sometimes treat the others to an Indian meal at the local Tandoori. 'It was great to be free spirits again', recalls Redding. The first album. 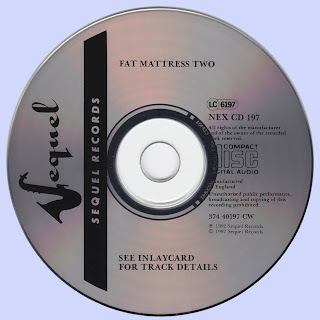 Fat Mattress One, emerged smiling and innocent into the sunlight. 'Even the technicians were impressed'. The following year, whilst being wooed by both Warner and Polydor, Fat Mattress supported the Jimi Hendrix Experience tour in the States. Redding would play guitar with Fat Mattress, then take the stage in his familiar role as bassist with The Experience. They returned to find two contracts on the table. There was no contest. Polydor's offer, up front with the promise of singles and two albums a year was too good to refuse. The money was incredible for the time. Polydor set up offshore bank accounts for each of them. 'They even gave us a Coutts cheque book', recalls Landon. The first album was released in the Autumn of '69 and rose to number 17 in England and 30 in the States. Magic Forest, the single, was No. 1 for a time in Holland. The band played the Isle of Wight Festival that summer, with Bob Dylan topping the bill. In December they went to the States in their own right and with a second album in the pipeline. In America the Mattress disintegrated. Jim and Noel fell out. The band played just 5 of the 30 dates before returning home. 'We just weren't ready to be a headline act', Jim remembers ruefully. 'It was all just meant to be a bit of fun.' The second album took three months to cut. There was talk of a third album, but it came to nothing. The inspiration was drying up. Landon is now 'somewhere in Germany', still singing 'like the old trouper he is'; Redding, whose career needs no introduction, lives in Ireland; Dillon flies Cessnas to the Isle of Man, while Leverton is back in his native Kent and still a working musician, playing bass, most recently with the late Steve Marriott's Packet of Three. This album, re-released after all these years brings with it the unmistakable whiff of lost youth, kaftans and some remarkable musicianship from the band that flourished briefly in that golden summer long ago.